The one with the power to vanquish the Dark Lord approaches… born to those who have thrice defied him, born as the seventh month dies… and the Dark Lord will mark him as his equal, but he will have power the Dark Lord knows not… and either must die at the hand of the other for neither can live while the other survives… the one with the power to vanquish the Dark Lord will be born as the seventh month dies…. There has always been contention over whether Harry Potter or Neville Longbottom, who both fit the requirements of the prophecy, was the Chosen One. But there was never any debate about who filled the role of the Dark Lord. He goes by many names in the wizarding world of Harry Potter: He-Who-Must-Not-Be-Named, Tom Marvolo Riddle, the Dark Lord, the Heir of Slytherin, and of course, Lord Voldemort. The world’s most evil and powerful dark wizard didn’t gain that reputation without doing a few horrible things. 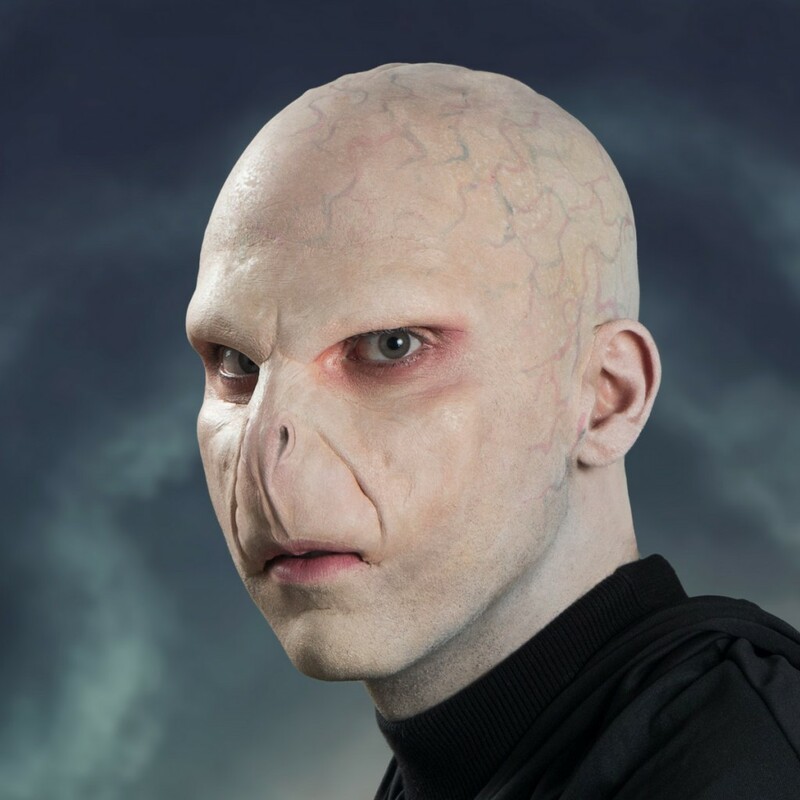 From splitting his soul into seven pieces, opening the Chamber of Secrets and sending a basilisk to attack the students, and just flat out murder, Voldemort has earned his titles. 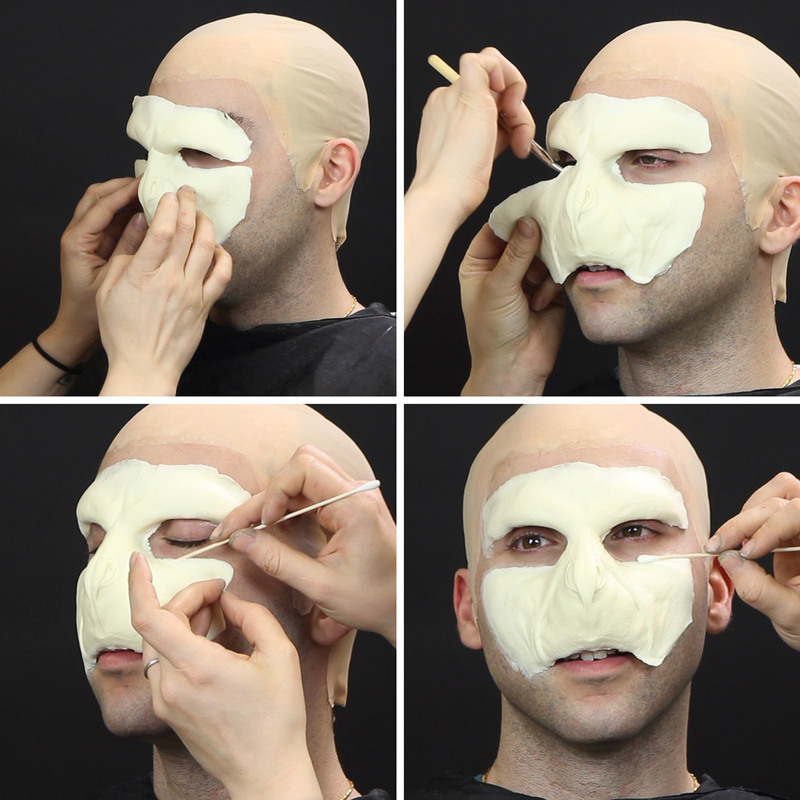 Now, you can show your pride as a Harry Potter fan and celebrate Halloween at the same time, thanks to our good friend Caitlyn Kreklewich, with this Voldemort makeup tutorial. 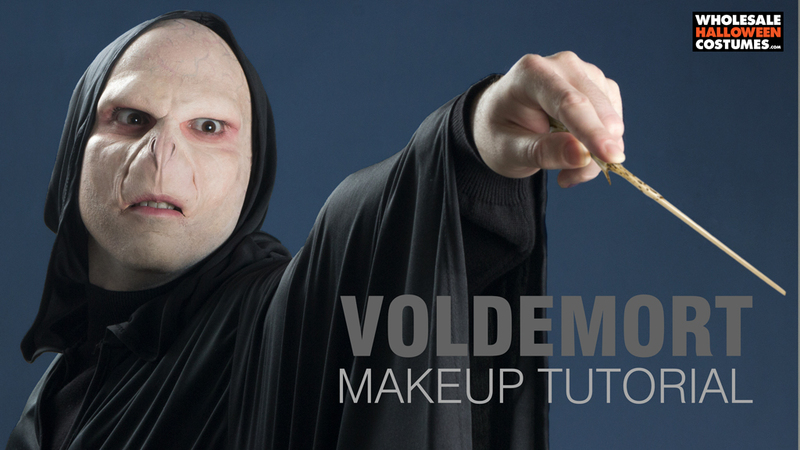 Wield the Elder Wand and command your Death Eaters with this incredible look that is sure to put the icing on the cake for any costume or cosplay. Check it out! 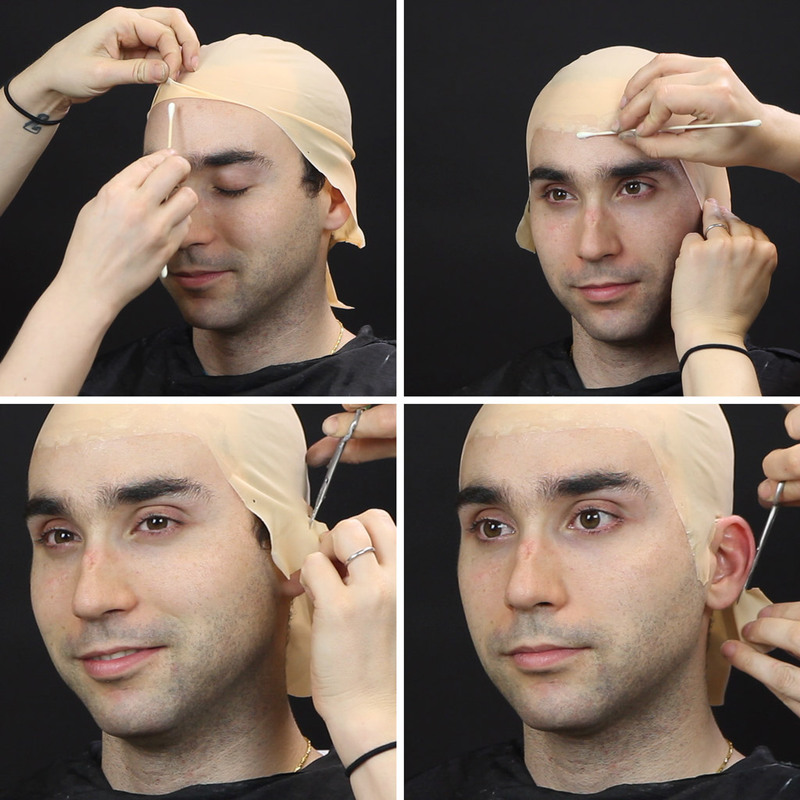 Apply a bald cap, unless you already have a freshly shaved head! Seal down the edges with the adhesive of your choice (we used Pros-Aide) starting at the center of the forehead and working your way down each side to the ears. Carefully cut off excess material around the ears. Finish sealing the bald cap around the ears and onto the neck. 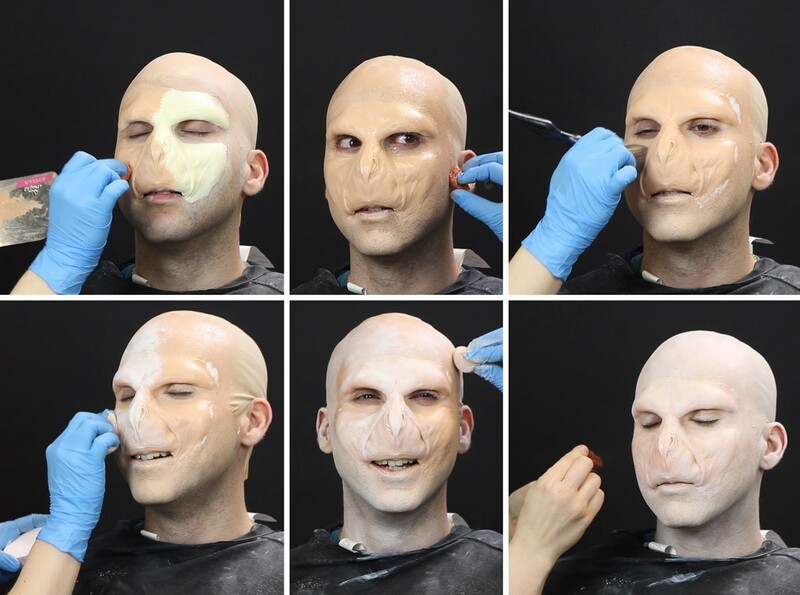 Figure out placement for the Voldemort foam appliance. Trace lightly around the prosthetic with a light liner. Apply Pros-Aide along the inside of the traced line on the forehead and cheeks. 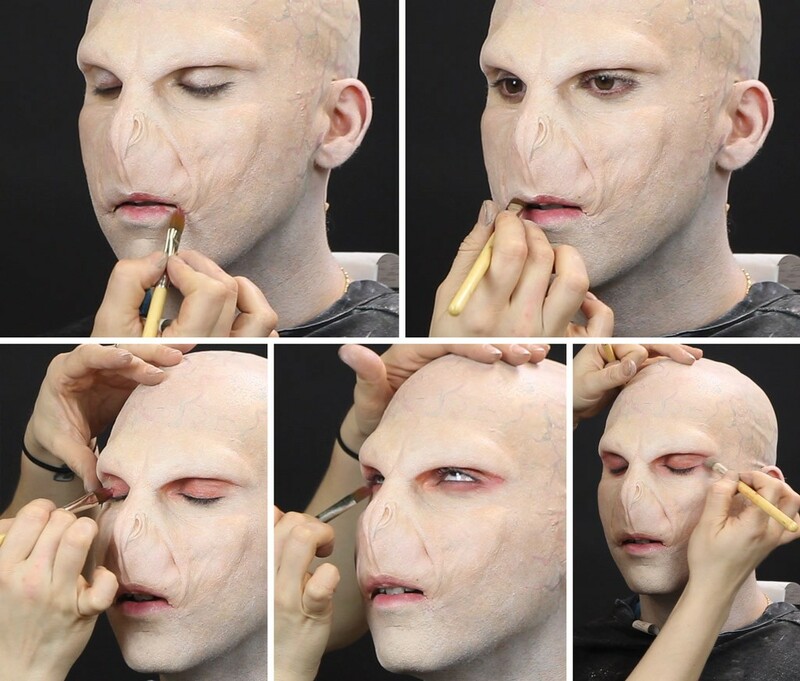 Press the prosthetic on to the face and hold it in place until it stays put when you let it go. Work your way around the edges with adhesive sealing them down using a cotton swab. Powder the edges then roughly sponge on thickened Pros-Aide to help conceal the edges. Repeat until the edges are smooth with the skin. Use foundation to match the tone of the appliance to the model’s skin. Apply the same tone over the skin and bald cap as well until completely covered. Then lightly sponge white makeup over the entire look. You don’t want opaque coverage here. You can always add extra layers if you want extra coverage. Thin the white makeup even more and use a stiff bristled brush to fleck pigment all over the face and head. This will add a little texture to help make the look more convincing. Begin applying the veins all over the head with a very thin brush and watered down turquoise makeup. Repeat the process with watered down violet makeup. Fleck again with thinned white makeup over the veins. Add a blushy pink color to the lips, concentrating the color on the inside edge of the lips and blending to keep the outer edge very soft. Use a similar blush tone to shadow to the upper and lower eyelids. Fill the nostrils with a dark grey shadow. Lightly blush around the nostrils. Just throw on your Death Eater robe and go cast some spells! For more incredible makeup looks and pop culture stuff, make sure you’re following Wholesale Halloween Costumes on Facebook, Twitter, and Instagram! It doesn’t have to be like memorizing a spell- save this on Pinterest!